Using solar power to aerate a pond and build a complete solar system. In my years of assisting pond owners with aeration systems I have constantly been asked if it is possible to use solar power to aerate a pond and my answer has always been: YES! Of course the technology exists to build a homemade aeration system from fairly cheap parts that works on solar power and the reason is because there are a number of suppliers who can provide solar systems not only for pond aeration but also to charge deep-cell batteries and even to power complete cabins by using full off-grid power systems. While the idea of using renewable resources as the cheap power source is definitely sound the reality is that many companies offer solar systems that are costly and such systems are currently designed more for the do-it-yourself style of pond owner. Of course all of my clients ask me why this is the reality considering that solar powered systems have existed for decades and there are solar pumps that should be able to perform the job to feed compressed air into diffusers...so why is this type of configuration so darned expensive? It is essential to understand that any solar aeration system will be more costly than a standard AC electric aerator. If you have electric power within 100 feet of the pond you might want to consider an electric system. Realize that all these solar systems, pumps and compressors won't have the same life expectancy as a similar electric system. Of course if you have no choice and are off the grid or just don't have power then go for a solar system! Contact us with any questions. The answer is that it doesn't have to be an expensive undertaking if someone really wants to add a solar fountain or a solar pump with a simple nozzle to create a spraying fountain-jet display or even a simple air diffuser system that operates with solar cells and direct current pumps. The problem is mainly the supply of such parts. Canadian solar supply companies are few and far between and even my clients in the USA have told me that buying solar panels and wiring kits anywhere in North America is not easy, especially if we are looking beyond the actual product but into the knowledge of installing solar power and building homemade solar aerators and fountains. After years of customer deman The Pond Report has brought Solar Direct aeration into its product lineup! with the introduction of the OWS AERMASTER DD solar powered aeration systems for remote ponds and lakes where power is not available, too expensive, or if you are off grid. Where a windmill isn't viable the solar direct systems, requiring no batteries, are also an environmentally conscious solution. Before we look at the intrinsic difficulties of finding a local supplier of solar powered systems in Canada or North America for that matter let us first look at what exactly is involved for someone wanting to build a simple low-cost solar powered aeration system. If you are like many of my existing clients you have toyed with the idea of aerating your pond without using expensive grid power. There are certain provinces and states that offer low cost electricity but even the most frugal electrical aeration systems can cost upward of 94 cents per day to operate and in higher cost markets these same systems can run up to 3 dollars per day in operating costs. It is no wonder that the question of self-sustained energy systems arises more often than talk about the weather! During my paid consultations I typically go over the same ground again and again so I will do it once again here so more of you can benefit from my knowledge. Of course I do not pretend to be an expert in solar power but for many people who come to me in search of information on Canadian pond supplies I have helped many save several hundred dollars just by being honest and explaining what works and what doesn't work. While I have been asked about everything from solar cabin kits and power system to full on solar powered fountains I will attempt to discuss some of the myths and impossibilities of using solar cells as a form of energy; the facts are that while solar power is a viable green technology it is also limited in that the initial setup costs are high and currently the ability to drive high powered pumps and solar powered compressors is limited. I much prefer an electrical system on a thermostat control or a timer compared to a solar aerator but the reasons are merely based on a desire for efficiency! If a system that was driven by sun power, or even wind power, could compare to the sheer power and control of an electric system I would be none too happy to switch! But still, I have never discouraged anyone who has their heart set on using solar panels for aerating their ponds from doing so, in fact their are ways to achieve this sort of cost-saving measure...well...it is cost saving in the long run but solar power is always more expensive as an initial investment so that is something everyone should understand who contemplates using this sort of system. The basic solar system requires a solar panel which is often a 60 Watt Uni-Solar Panel or a series of one or more 50 Watt Kyocera Solar Panels running together. These panels are mounted together in what is called a solar array on a pole and usually face towards the sun by manual positioning or in the case of more sophisticated systems an automatic solar tracking system. An air compressor is needed to create compressed air that is pumped to the air diffusers in the pond and there are a few varieties of pond pumps that will correctly do the job; usually in a solar direct system you will need a direct current DC compressor such as a Thomas pumps. I have found that the Thomas line of solar pumps offer an adequate mix of PSI and CFM which, while not as strong as the electric versions, still can offer good aeration in fairly small ponds with depths not exceeding 10 feet. I have built systems using a rotary vane compressors feeding two or more diffuser discs using direct solar power but again these are packages that are recommended mainly as a last resort when there is no electrical supply within 500 feet of the pond. Beyond the need for aeration I am also asked constantly about solar pumps for fountains. Most floating mountains or even fixed base submersible fountains require large horsepower pumps to drive thick columns of water through brass nozzles to create dramatic effects and to create a large display such as a crown and geyser display using a solar pump is not financially feasible. Of course there are pumps that can be simply placed into a pond or dugout and with the addition of a brass fountain nozzle can create dramatic displays of height but the limitations of amperage inherent in solar pumps means that only smaller water bodies like water gardens can even entertain the concept of a solar fountain. Solar fountains just don't have the power to push water beyond more than a few feet above the water level unless they are large scale and typically expensive systems. Even when I visit a eutrophic pond in need of major treatment I inevitably come upon the question of solar systems designed to power cottages or country homes. There are cottage and complete solar systems that retailers create that include homemade packaged photovoltaic power systems from 50 to over 2000 watts that are perfect for providing full power for small cottages and vacation homes. These store bought systems usually come complete with cutting edge solar modules, controllers, mounting hardware, batteries, wiring and installation guides. Basically all you need is a few basic tools and a few hours to build your solar installation. Most of these systems are expandable especially if you consult a local solar dealer for tips and ideas on building a do it yourself solar system! You can always add on more solar modules at a later time or improve your system with a windmill or a micro-hydro turbine if you have running water on your property. If you are thinking of adding more solar modules in the future it may be wise to select a pole-mounting structure capable of holding additional solar panels and choosing a voltage controller capable of handling the additional power. There are standby-grid-tie systems that not only allow you to feed power back to the grid, but it will also offer you the security of back-up power in the event of a power failure. During sunny days the solar array mounted on your roof for example, will feed extra electrical power back to the utility grid. In many provinces and states you may be able to sell your excess electricity to them via the hydro electric lines. During a blackout or major ice storm or even a terrorist attack the systems deep cell battery bank will provide you with the electricity to run multiple loads including furnaces, refrigerators, lighting, computers, televisions and phones for homes cottages and small businesses. Where can solar aeration be used? Most Solar aeration systems are custom-built for ponds and lakes when AC power or an air line from a AC powered system is not practical. The Solar panels can be designed and sized easily to supply power to a water pump or a combination bubbler and water pump. Designing a solar powered system can be done quite easily. For example, a pond of 2,400,000 litres or 650 000 gallons can be properly aerated with a minimum of 0.5 - 1.0 CFM (cubic feet per minute) at a minimum but if we can provide up to 4 CFM we can create multiple aeration zones by using multiple diffusers. Again, the limitations of the DC compressor are the key variable. For proper solar system design, the compressor size and combined power requirements should be calculated for correct aeration. Once these mathematics are calculated, the precise number of solar panels, wattage and batteries can be determined and implemented. I have designed a standard indication showing the approximate component costs for a solar powered aeration system. The following formula is often used to determine the number of solar panels required. Example: (based on Canadian summer use) An average Canadian summer day will provide about 6.0-6.5 hours of charging time equaling a 12-volt compressor rated load of 3.8 amps (45.6 W) per hour. To determine the number of panels using the formula, the following is calculated. 12v x 3.8amps x 24hr x 1.1bf = 1,204 Watt/hrs Based on this initial calculation, three solar panels will be required. This assumes use of 64-watt panels, which produce (64 watts x 6 hrs) 384 Watt-hrs per day. Therefore, (1,204 ÷ 384) = 3.1, round to three panels. When installing a solar powered aeration or watering system, one should determine the number of batteries needed or calculate how much deep charge battery power is required during cloudy periods or if the panels are disconnected. This calculation will depend largely on how often the system is inspected and I recommend a battery storage capacity of three to five days. In this generic example, if four days of storage are required and a six-volt 220-amp hour battery is being used, then you should calculate the number of batteries needed using the following formula: Load: volts multiplied by amps (Watts) Duty cycle: running time percent Run time: length of time required To determine the number of batteries using the formula, the following is calculated: 45.6w x 1.0 x 96 hours = 4377.6 Watt/hrs The number of 220 A/hr batteries required is 3.32, rounded up to four. This is achieved because a 220 A/hr battery holds (220 A/ hr x 6v) 1320 Watt/hrs, which, when divided into reserve capacity equals 3.32 batteries to get four days of reserve capacity. I recommend using six volt batteries because they provide the best storage life. For a 12-volt system, the batteries must be used in increments of two in series equaling 12 volts; and for a 24- volt system, increments of four in series that equal 24 volts are required. Cost of Solar Aeration Depending on the system components used, pond solar aeration can vary from as low as $1,900 (solar direct - with no battery storage) to $18,500 for 24-hour aeration using multiple diffusers or shallow linear aeration diffuser tubing. "Solar Power (Photovoltaic, PV) Photovoltaic, known as PV, relates to the production of electric current at the junction of two substances exposed to light. Photovoltaic systems consist of solar arrays (solar panel) that convert sunlight into direct current (DC) electricity, which can be used directly or stored in batteries. Most DC systems are 6, 12 or 24 volts, or by using an inverter can be converted to alternating current (AC). Solar panels consist of silicon cells, which have no moving parts, are durable and have a life expectancy of 25 years or more. Most solar arrays begin delivering power or charging batteries with as little as 10% of sunlight with each cell of the array converting approximately 14% of the available energy to DC power. " 2. Solar Pond Aeration and pond aeration. "Turnkey solar power pond aeration systems are a good alternative to a windmill pond aeration system. SC Solar has been providing solar pond aeration systems for years. Solar lake bed aeration is extremely important to the health of isolated ponds. Golf course pond and farm pond stagnation problems are eliminated with our solar pond aeration systems. We also use the aeration system for the hog waste industry problems to increase the decomposition of swine and other livestock waste issues. Call to discuss your hog waste lagoon options. SC solar may have the answer that you have been looking for. ."
"Solar fountain pumps can be used to create solar powered waterfall, pond and well projects. Crucial to the appearance of a well-designed garden is the lighting system and water features selected to enhance it. Silicon Solar is the proud manufacturer of a variety of solar fountains and solar water pumps. Below you will find wholesale, manufacture-direct prices on solar powered pumps & fountain kit sets. We also carry a large selection of cascading fountains and many other complete fountain kits. With our unique solar fountains, we provide a wide selection of water pumps and other items that can be used in creating waterfalls in many landscape projects." 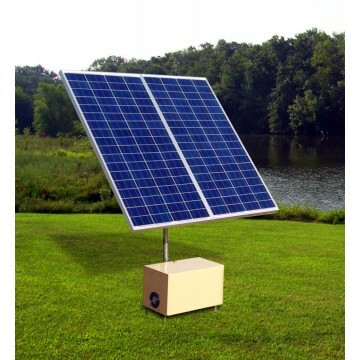 "The solar panel activates the pump automatically and provides nearly continuous aeration. Our Solar Bubbler Pump Kits come complete with 0.09 cfm submersible bubbler, anchoring attachments, 16 feet of air tubing and a 0.5 amp, 18 V solar panel. A standard 12 volt car battery (not included) is also required. Yep, it works at night! The battery is charged (continuous operation requires 4 hours/day of direct unfiltered sunshine, 40 watt/hrs) by the built-in solar panel while allowing the pump to run continuously for up to *2 weeks of cloudy days (rainy days provide more oxygen/mixing than many aerators) and indefinitely through the evenings on sunny days. That's right our unit is designed to maximize the use of the built-in solar panel to charge your standard 12 volt car battery while operating the bubbler. Other units on the market do not operate at night or require you to buy several additional solar panels and elaborate battery stacks and control systems that cost thousands of dollars to do what we do with every single unit. They just don't get it, you need our aeration that operates 24/7, not theirs that only operates during the daylight hours." "We definitely understand the need of many to have a small off-grid solar powered cabin away from the cities and tucked away where you can escape the worries of everyday living. You probably built it yourself or played a major part in it's construction and whether it's made of straw bale, brick, wood, or some other form of alternative construction, it would probably be just a little homier with a little sunshine generated electricity. Well, we can sure help there... What you see here is a just a few of the entry level solar cabin kits we offer. We are happy to offer free quotes on solar cabin and solar home power systems of any size. " ""This pilot project is an exciting next step in solar energy becoming a mainstream technology in Canada," said ARISE President Ian MacLellan. "Last year in Japan, there were more than 25,000 solar homes built and more than 100,000 systems have been installed since 1994. This project will show in the Canadian context that solar energy can also make a significant contribution to the environment, reduce consumers' expenses and increase home comfort." ."